The gay liberation movement, sparked by the fiery Stonewall rebellion in Greenwich Village in 1969, was remarkably robust in its early days, bringing thousands into the streets in big cities such as New York and San Francisco to march for social and political equality. By the 1980s the gay community was more a market segment than a movement. Advertisers vied for gay dollars with products and services tailored to a young, mostly male audience seeking adventure, freedom and fun. 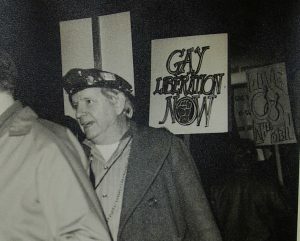 Morris Kight at a 1970 protest in West Hollywood. Photo: Pat Rocco. With the rise of the New Right, gays and lesbians found many of their recent political gains under attack or even rolled back. Morris Kight, a longtime gay rights activist who organized L.A.’s first pride parade in 1970, watched the evolution of the movement with alarm. In his eyes, there was too much unfinished business and too much time devoted to partying—not politicking. Despite his warnings, it would take the shock of the AIDS epidemic and the federal government’s shameful inaction in response to the disease to spur the gay and lesbian community to refocus on political organizing and direct action. I interviewed Morris in 1982 to discuss his work on behalf of the gay community as well as his prescription for change. The interview, recorded for radio station KPFK, is preserved by the ONE National Gay and Lesbian Archives. Morris died on this day in 2003. Among the organizations he founded or co-founded are the the Gay Liberation Front, the Los Angeles Gay and Lesbian Center, Christopher Street West, the Stonewall Democratic Club and the Van Ness Recovery House. He served on the L.A. County Human Relations Commission for two decades.